This article is 2793 days old. Have you heard the Windsor/Essex County Hum? That’s the name attributed to mysterious vibrations and rumblings felt and heard every day by many residents of West Windsor, LaSalle, and other westerly parts of Essex County. “The Windsor/Essex County Hum” Facebook group has become hugely popular over the summer as members struggle to determine why they’re hearing these rumblings and vibrations. Many describe the rumblings/vibrations as very disruptive. The ‘hum’ has been described as a low, pulsating vibration like that coming from loud music (bass) from an idling car, or the rumbling of a transport truck. Over a hundred reports have been logged with the local branch of the Ministry of the Environment, and seismology tests have proved inconclusive. Frustrated with the lack of official explanation for the hum, the members of the Hum’s Facebook group have taken it upon themselves to try and determine the cause of vibrations felt by hundreds if not thousands of local citizens. Group administrators have released a Google map pointing to several possible vibration sources including two “notable locations”: “BASF Corporation…in Wyandotte, MI” and “Zug Island – Massive Industrial Complex that is very old with many industrial size fans”. Click here to view the map. Organizers ask the public and members of the Facebook group to “Please find your location and draw a line straight through the direction you are hearing the hum.” The map is open to public collaboration and anyone is able to add their location to it. 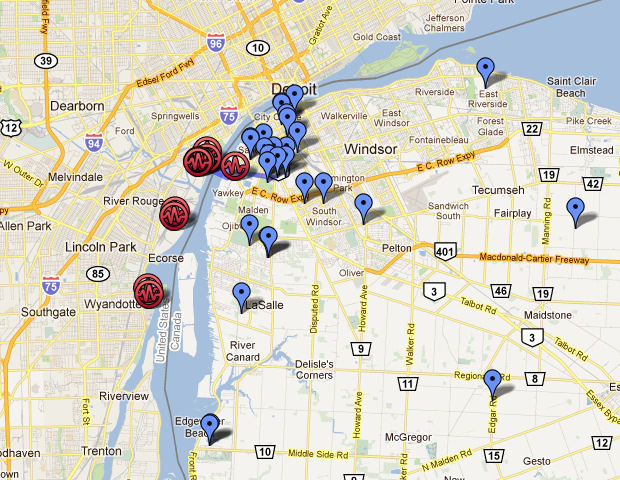 Check out the Windsor/Essex County Hum group on Facebook here, and the map here.